Super Prime Steelhead Dates & Half days available. Muskegon River Steelhead – Massive 23 lbs Male Steelhead landed while float fishing with beads. Giant Fall Steelhead. Bright Chrome Steelhead is the name of the game. Muskegon River is the home of the chrome. Good numbers of fish this fall. Mild temperatures over the last week have definitely helped the Muskegon River Steelhead fishing. Water temperatures still hovering in the mid 40’s with the river level being medium to low. Water is perfect and quite clear, with a slight tea stain look to it. Small spawn sacks, beads, and jigs tipped with wax worms are all fishing well. Steelhead seem to be above average in size this fall. We have been landing some duker steelhead! Recent Water Levels have now stabilized into perfect Steelhead fishing conditions. Levels are normal and very clear. 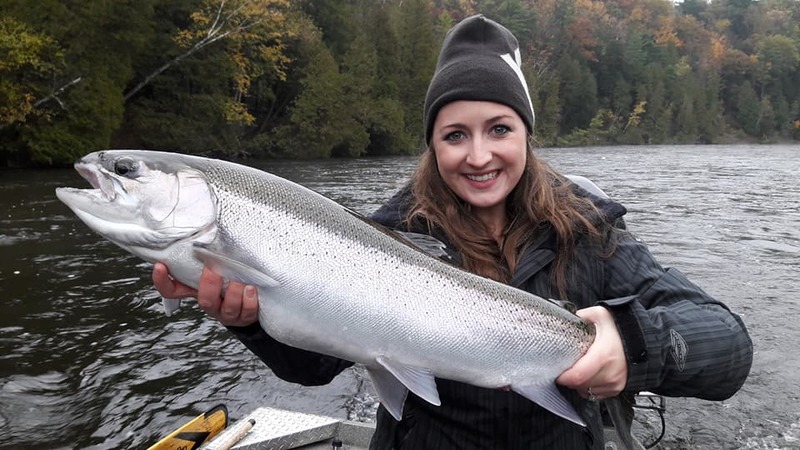 Spawning Salmon have brought in large numbers of bright chrome, giant Fall Steelhead into the Muskegon River near Newaygo. Lots of steelhead have now pushed up into the Croton Dam area. Definitely one of the largest year class of steelhead in over a decade. If you want a trophy wall mounter,this November is going to offer opportunities for trophy fish. There’s big Steelhead and lots of them. Steelhead fishing has been exceptional this Fall. Big fish & lots of them. Michigan Fall Steelhead have been huge so far this season! Fish of a lifetime! Double digit Steelhead are going to be the norm this year. Salmon, Steelhead, and Trout are huge this year! Michigan Steelhead Fishing. Big Smiles and Lots of fish being landed. More Great Steelhead Fishing to come. Muskegon River. Steve displays a giant Manistee River Fall Steelhead. Steelhead fishing is excellent right now! Brian with a gorgeous salmon, This is the time of year that every angler prays for – Chrome jumping through the morning mist. Whether it be Salmon or Steelhead. It’s game on right now. Jim with a prime fall steelhead. Average is abouth 5 lbs larger than normal – Averaging a fish per hours. Bobber down! Home of the Chrome! Fall Steelhead fishing is on fire. Fish are huge this year. If you want a mounter Steelhead, this is the year to so it. Chrome Bullet Steelhead.